The original band started in Orange County with the hopes of going big time (Hot Wings), but were unable to give up their day jobs (Cold Feet). And thus their band name was born. 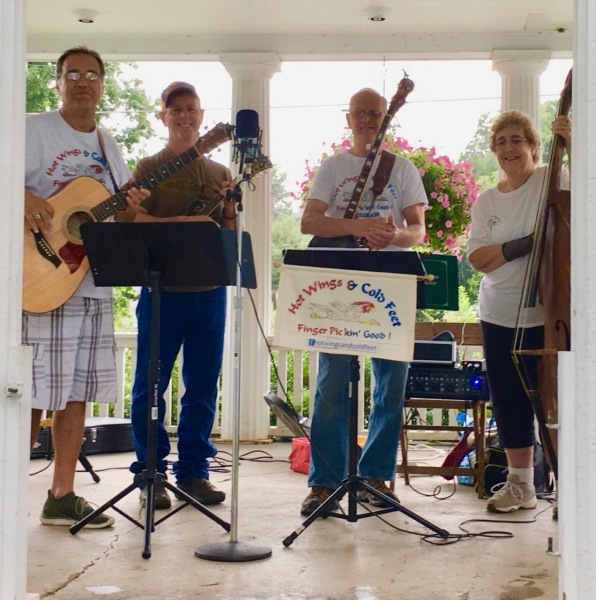 Hot Wings and Cold Feet is a popular local bluegrass band, specializing in great harmonies with a reverence for the traditional bluegrass sound and a touch of progressiveness. They have a reverence for gospel and songs of earth. Their aim, they say is to be sure audience members always leaves with fond memories of the show and a smile on their faces. If you want to describe Bluegrass music, Ken Klaiber says, this quote by Don Reno, a very famous bluegrass banjo player, talking to Ralph Emery in an interview, says it all. In 1987, Ken took up banjo and Bluegrass music. He has played with several local groups bringing his 60+ music-related years of experience with him. Nancy started playing Double Bass 1990 and has played with several local groups. John has been a bass player for 40+ years, He took up guitar 2015 and discovered Bluegrass music. He has brought his years in music, talent in arrangements and harmonies to the group. Cliff has played guitar most of his life and mandolin most recently. He also plays in his church and has been with several local bands. He brings his knowledge of Bluegrass and vocals to the group.